Holy City Hogs raises all our animals outdoors wild and free like Mother Nature intended. Our herd is comprised of many different heritage breeds and heritage farm crosses. Ossabaw Island – Blonde Mangalitsa – American Mulefoots and Berkshires are our pure bred lines but we also utilize Tamorth, Duroc, Hampshire, AGH and Large whites in our farm crosses we call Wadmahogs. Our hogs are allowed to roam in large pastures and wooded lots under hundred year old oaks imparting the real flavor of the Lowcountry. 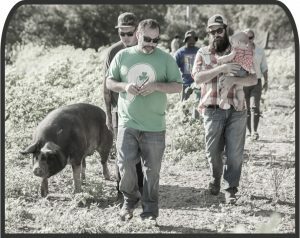 Holy City Hogs travel the country sharing our passion for heritage breed hogs and whole hog BBQ. 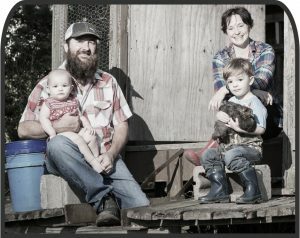 What started as a family tradition for Tank with his Father and brother building their own smoker 20 years ago to compete in the Big Pig Jig has blossomed into a true farmer to table catering service. 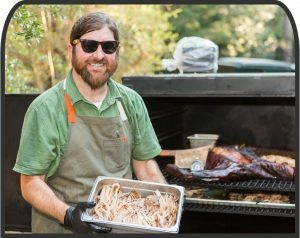 We specialize in cooking lard breed hogs on General George Washington our BMF 200 smoker built by our good friend Pitmaster Carey Bringle the PegLeg Porker. We are members and we supply the pork for the famed Peg Leg Porker Smokers competitive BBQ team for The WORLD BBQ championships at Memphis in May. Our animals are available at some of Charleston’s finest culinary destinations. As a leader in local heritage breed protein production we strive to only work with chefs/restaurants who truly respect the sacrifice animals make to arrive on the plate. Whole animal butchers and diverse pork programs that waste nothing help us share our message of sustainable proteins. We won’t “SPAM” you WE PROMISE! You may always opt out automatically as well.